We’ll meet near the Snail’s Pace store at 6:00 p.m. (We gather in front of the In Flower floral shop, which is located between Snail’s Pace and Lascari’s. The new Snail’s Pace classes started this week. We should try to park in the Lamps Plus parking lot if possible, so that there will be ample parking for the academy students and shopping center customers. Cross St. at Birch St. Welcome RAMZEY!!! Ramzey ran with us at the loop on Saturday. It was a pleasure to meet you! BR Sighting in Maui: Christina says ‘Aloha’ from Maui. She ran a 5K race there with her twin sister, Nina. Congrats on Completing State Marathon #33 MARGARET!!! 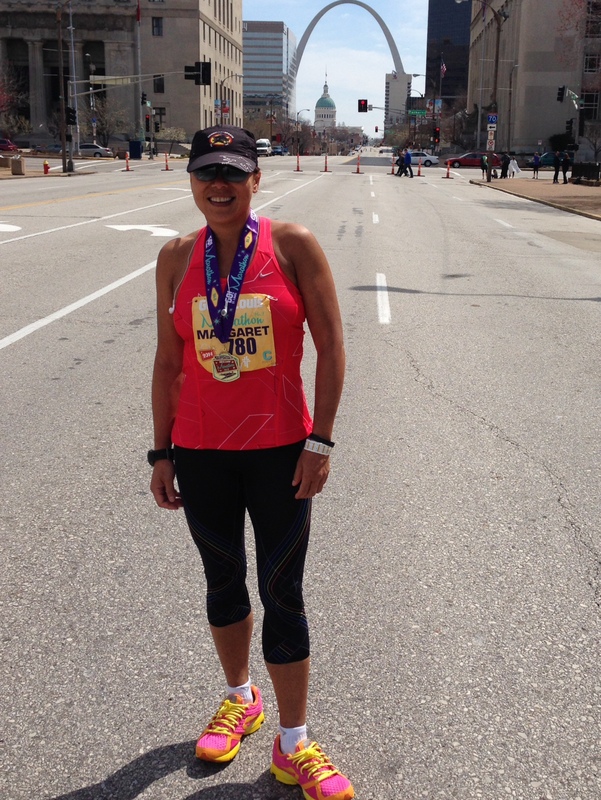 Margaret said that the St. Louis Marathon was a nice course with continuous bridges and hills.